We all want to make smart, innovative decisions but the question is, how? 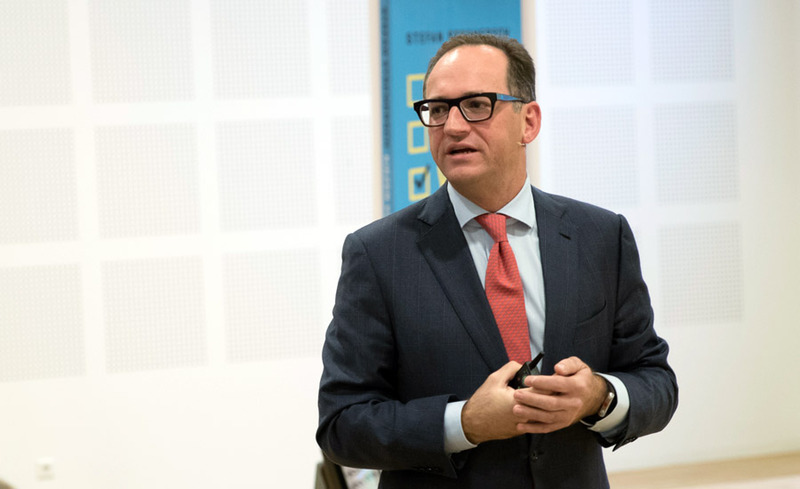 Prof. Stefan Stremersch talked to IESE alumni and friends gathered at the Munich campus recently about how companies should approach this dilemma, in order to come up with innovative solutions to strategic issues. Steinway, the renowned piano maker, solved the quandary of how to grow while keeping its brand exclusive by introducing two more affordable brands: Boston and Essex. Unilever, confronted by criticism in the U.S. that it was destroying the rainforest, entered the Indian market in collaboration with an NGO. The partners launched an awareness campaign in India about hygiene and the importance of hand-washing in preventing contagious diseases. For Prof. Stremersch, the way to innovate is through a process he calls Inspire, Diverge, Converge. Inspire. First, find inspiration outside yourself, Prof. Stremersch says. Studies show that two-thirds of managers think their own company’s past decisions are more relevant than other companies, and three-fourths expect to find inspiration inside rather than outside their industry. This mindset systemically undermines true innovation. And it can be worsened if human-resource policies lead to hiring similar people with similar backgrounds, a situation familiar to many of those who attended Prof. Stremerschs talk. Diverge. Innovation springs from bringing together different perspectives, he says. Leaders must take the strategic decision to use the diversity of their teams in order to fully embrace the complexity of a dilemma. Converge. This last phase brings together the different approaches to a dilemma and makes them workable. Prof. Stremersch has written a book, How Winners Make Choices, in which he details the decision-making process. The book was released in Dutch in September and will be available in English in the coming weeks. But every company has to find its own approach toward innovation. The lively discussion that followed Prof. Stremerschs talk found two positions on which to converge: companies must look outside their own sectors and top management must be on board.